For a small business, every penny, and every minute of its time, is important. This is where cloud based tools can level the playing field and ensure that work can be done smartly, accurately, quickly, and often, even automatically. As we prepare to enter 2018, let’s tell you about 6 must-have tools for your small business. Tradify provides an end-to-end service, including delivery tracking, managing, and invoicing, giving you complete control of your business via all kinds of devices. Real time job allocation and super smart scheduling functionalities make Tradify a must-have for any business with a workforce of technicians and knowledge workers. Estimating and quoting for jobs and projects can be easily done via this cloud based tool. With tremendous applications in service markets such as plumbing, HVAC repairs, and construction, Tradify digitizes the most important components of the business – job allocation, scheduling, tracking, and billing. With Tradify, you can track progress on every service and repair project by the minute, and can connect with on-field technicians in real time. The tool is well integrated with accounting software like XERO and MYOB, which makes bookkeeping much easier for your business. Bad customer service could pull down your business before you can even react. Use Groove instead of running the risk of letting the odd customer complaint or request go unattended. 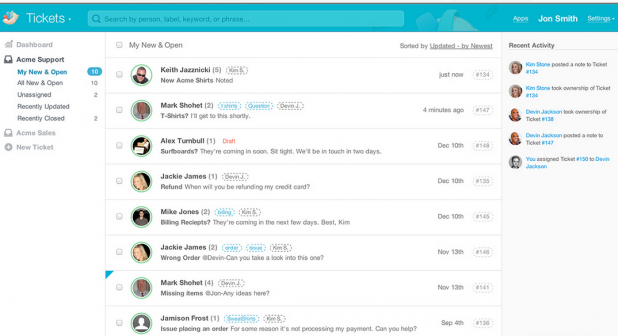 Groove transforms your mailbox into your ticketing tool. Create service desk tickets right from your customer emails, assign them to agents, track progress, use ticket statuses for tracking, merge repeat tickets, see full customer support history, and do everything you can with a dedicated help desk tool. The best part – your email responses are automatically updated in ticket work-logs, which makes Groove a totally hassle free and agile tool. With Groove, you ensure that your knowledge base is accessible 24×7, even if you are not awake or available. Customers can quickly search for answers using Groove, and get their problems resolved without even getting an agent involved. Groove supports 12 languages and supports multimedia in its content creation interface. Groove also provides you a contact widget that can be leveraged to deliver quick support to customers. Slack is pretty much all you need to manage communications on any kind of project. It takes a novel approach to delivering advanced communication features, connecting people from different teams together with a very intuitive, classy, and easy to use interface. 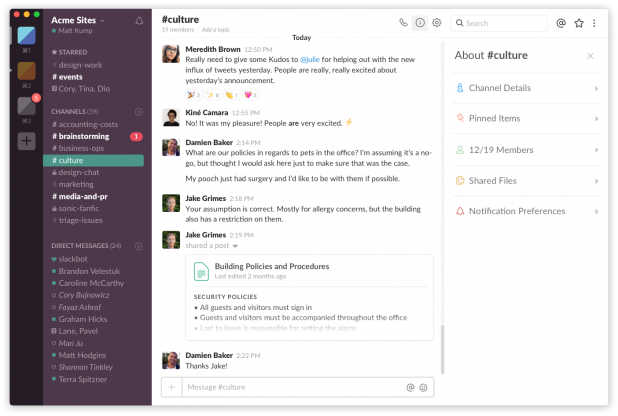 Slack organizes communications across different channels, which makes it super organized for everyone to make sense of things, even with dozens of people involved, and dozens of projects running in parallel. In doing so, it creates a searchable archive where information can be found within seconds, letting people judiciously choose which meetings they want to attend, and which to skip (depending on Slack message search later on). Slack puts your project collaboration efforts on super-charge mode by integrating with almost every office productivity app used these days. And, you can even use Slack’s API to set up complex workflows. For anybody in the knowledge market, delivering content via webinars is a scalable and low-cost method of distribution. To monetize your business plan around it, however, you need a power-packed webinar software package, and that’s what ClickMeeting is. This branded webinar delivery and management software is all you need to connect with audiences, and to train your employees on remote locations. 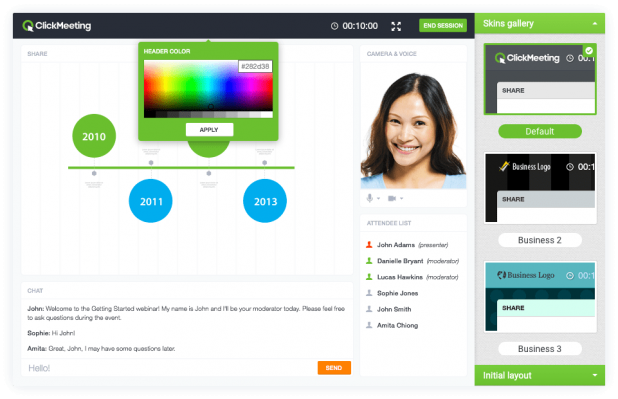 You can quickly create branded invitations for your webinar sessions, host hassle free and interruption free webinars without investing in expensive equipment or software, and let audiences interact with you and share their questions and feedback. ClickMeeting lets you record your webinars, which adds to your knowledge library. Webinar storage, attendee statistics and trends, branded thank you messages, performance rating, and social media sharing – ClickMeeting has it all. You can use the free version for a 30-day trial before purchasing it. QuickBooks takes the hassle out of book keeping and billing for your business. Not only does it keep all your expenses organized at one place, but also delivers advanced analytics features to deliver complete financial management solutions. No wonders, 4.3 million plus customers use it already. You can integrate your bank account with QuickBooks and let the software automatically import transactions and categorize them. Quickbooks Mobile is a great value-add; your employees (particularly the field personnel) can easily click snaps of receipts and store them using Quickbook Mobile. Quickbook’s billing solution is impeccable; you can automate reminders to your customers (which can significantly improve your receivable collections). Then, you get access to all kinds of reports that help you get more insights into your billing practices to help you improve them. Social media marketing is a massive enabler for small businesses, provided you do it like the big boys of your market. HootSuite lets you do so. 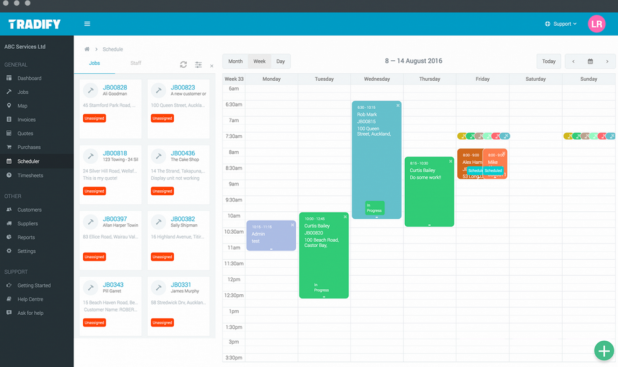 The best part – you can schedule social media posts (100s of them) across your social media accounts and can manage everything from a single dashboard within HootSuite. 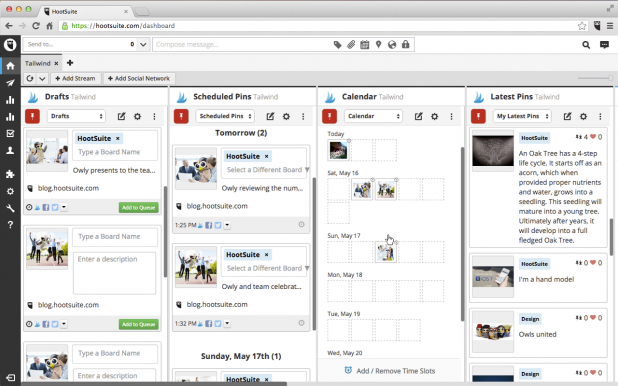 Content creation can also be improved via HootSuite, as it lets your team upload content in your favorite cloud service, and lets you approve the content. Analytics make HootSuite a catalyst for your social media ROIs. It generates super quick, super accurate, and super easy-to-understand reports to help you understand social media conversions, separated across channels, and across paid and owned campaigns. You can even use HootSuite as a basic social media monitoring tool, to find and filter social conversations with specific hashtags, brand mentions, and locations. Take control of the essential business functions of your startup or small business with these tools, now!